Ah… the joys of treasure hunting! It can be such a great way to spend your Sunday afternoon–just ask Dr. Garlic. Along with traveling buddies Sven and Corin, Typhon’s spent the past week hunting for gold. Sven had recalled that the mystical homebody they’re searching for typically requires his clients to bring him his weight in gold before deigning to consider considering hearing what they might have to say. Since Dr. Garlic really had no idea where to look, he let Sven and Corin figure it out. Unfortunately, Sven had a brilliant idea. “Since Father’s tales of World-Embarkers were true,” he reasoned, “who’s to say that his tales of hidden gold weren’t real as well?” It was good enough for Corin, so the three left in search of the cave from Ali Mama and the Fourteen Thieves! Long story short, they didn’t find it. But that didn’t bother Sven! They quickly set off in search of Davy Crockett’s locker … and didn’t find that either. They went on many other wild goose chases, but found nothing … that is, until Corin suggested they find the Evil Spider Cave of Gold. This morning we left in search of the Evil Spider Cave of Gold, a treasure trove supposedly guarded by a magical spider. I admit that I was a bit skeptical about the cave’s existence after having gone off in search so many nonexistent treasures. I suppose I was just becoming a bit tired of looking for gold that just wasn’t there. As it turns out, though, the cave was no hoax, and we’ve got proof! But I’m getting ahead of myself now. The entrance to the cave was blocked by an ancient spider web. It was so old, in fact, that when I tried to get rid of it with my sword, it simply crumbled like it had been petrified or something! “That must have been one old web…” said Corin slowly, as he stared at its remains. Nonetheless, Corin told Sven that we at least had better take a look inside, and Sven reluctantly agreed. Within the cave, we found another web, but a much newer one than the first. This one was still sticky and everything. “Maybe the spider is here after all.” I said, causing Sven to gulp audibly. “Let’s try to get it to come out of hiding. 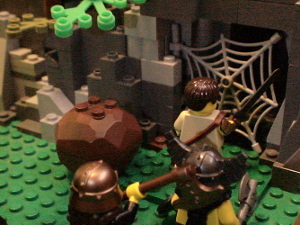 Hey, Shelob, we’re stealing your all your treasure! 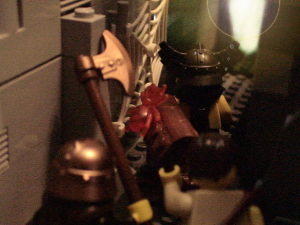 You’d better come out and maul us!” Corin shouted. The crafty Shelob about to maul Sven! Sven pulled the weighty chest towards the cave’s exit, but suddenly I spotted an enormous orange spider climbing onto the chest. Apparently stealing its treasure had provoked it. “Sven!” I shouted, trying to warn him. He jumped up, ran in circles, and screaming at the top of his lungs the whole time, did everything he could think of to get the spider off. He finally swung his arm (and the spider on it) into the cave wall. 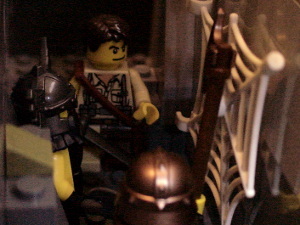 This seemed to stun the spider, which finally fell off of Sven, and Sven grabbed the chest and sped out of there! It was quite a sight, to be honest, but we did end up with the gold, so all’s well that ends well! Also, Corin said that unless the thing that should never have been given a lemon lollipop has gained a lot of weight, there should be a good amount of this treasure that we can keep for ourselves. I’m thinking that I’ll use some my share of the treasure to buy myself a new set of clothes. With these clothes I’m feeling as conspicuous as an Earthling on Multera. Which, I suppose, is easily explained. Sounds like Sven’s got a morbid dread of spiders (or maybe just a bad case of arachnophobia)! I think the best cure would be for him to pay a visit to good ol’ Convergence Point, maybe on Face Yer Fears Day. Anyway, I shouldn’t make fun of Sven. I probably would have reacted even worse than he did! A large malicious spider in your beard is nothing to joke about, after all. Thanks for reading; I’ll see ya next post! Peter, what was that about ‘Davy Crockett’s Locker’ !!! Add other impudent embarrasing things like that, and Alecia Garlic won’t have anyone to forward her diary entries to! That’s embarrassing. I misspelled a word in the last comment!